Nashville area drivers who are serious about driving a vehicle that is known for style, quality and performance undeniably choose BMW cars and SUVs. While exceptional engineering goes into each BMW that is produced, the performance, safety and overall capabilities of a BMW are also linked to the tires. Quality tires that are properly maintained in great condition may keep expensive vehicle repairs at bay. 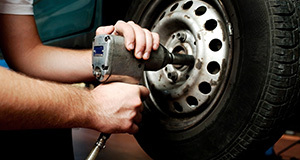 Through periodic tire service, your air pressure and tire tread can be moderated. In addition to reducing the likelihood of expensive repair issues from developing and extending the life of your tires, these critical factors can also affect your BMW’s fuel efficiency capabilities, the safety of you and your passengers on the road and more. BMW of Nashville’s auto service center is the place to go for all of the tire services that your BMW needs now and in the years to come. With numerous Nashville service centers that offer BMW services for tires and other systems and components, you understandably want to select a service center that will produce exceptional results for you each time your car or SUV requires service. BMW of Nashville’s auto service center is staffed by a team of certified technicians. Our technicians have all of the training and experience necessary to complete high-quality work on every type of tire service that your vehicle will need over the years. Their expertise extends to all vehicle systems for any make and model. Our services are available to you in our convenient location and during extended hours of operation. We make it easy for you to properly care for your BMW and for any other vehicles that you own. Whether you need assistance with your tires or other systems, trust our service technicians to perform excellent work. There is more involved in quality BMW services than getting assistance from certified technicians. At BMW of Nashville, our technicians are equipped with all of the necessary tools and equipment that are required to produce excellent results with efficiency. To further ensure superior results, our certified technicians also use OEM parts as replacements. OEM BMW parts are preferred over the aftermarket parts that many other Nashville area service centers use. These original equipment manufacturer parts are the same types of parts that the automaker used in the production of BMW models. Replacement parts may be needed for BMW tire services as well as for any services for related parts, such as struts and shocks. Taking great care of your BMW requires the assistance of a full team of certified automotive technicians. Tire service is just one of the many types of services that your BMW will need, and you can rest assured that we have the skills, tools and parts necessary to produce speedy results with quality workmanship. We want to be your trusted partner for your current and ongoing BMW maintenance and repair services, and we are eager to begin working on your tires. To request assistance from our certified technicians at a time that is convenient with your schedule, call us today.